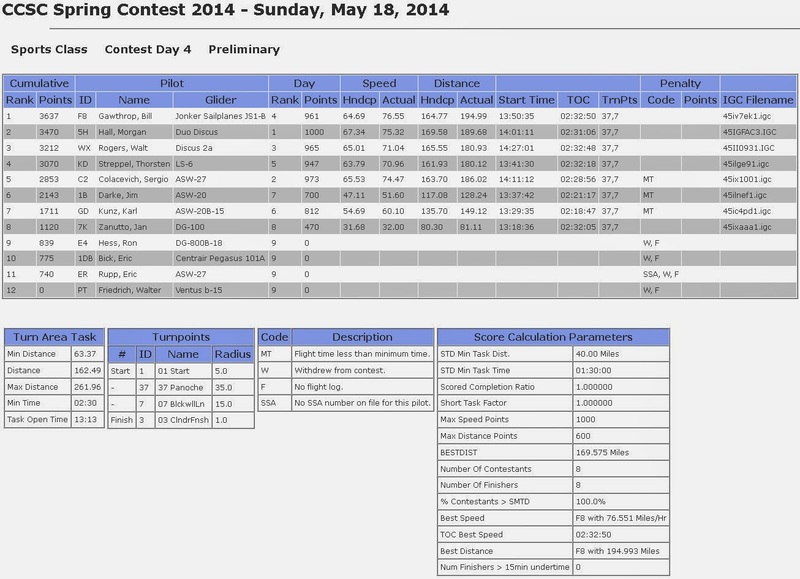 Saturday, May 24, 2014, a very good day for most of our pilots. Comment: The lift got stronger as the day wore on. Tow pilot: Jan Zanutto. Andrew Ouellet. Thanks, Jan and Andrew. It was a day when on the ground it didn't seem so good, but once in the air, most of our pilots had superb flights regardless of how much experience they had before today. Even late in the day, as Ethan will attest in his following comments, the lift was 1000 feet per minute as late as 6:30 in the evening. But let's let the pilots tell their own stories. Started late at 3 pm, but it seemed like the day was only getting stronger, as the late afternoon progressed. Hit a few boomers on tow, so at 1200 AGL I decided I'll climb faster without the tow plane. Quick climb and off to Black. Few wisps were popping up, on the west side of the mountains, which was kind of a tease, because they were just a bit too far, at my 4000ft. to keep glide to the east side, and it was a bit too early in the flight to commit to the other side, before knowing how good this day is yet to unfold. Fortunately, the ridge of Black worked well enough for a decent climb to 7000, and from there, I was heading to some nice distant clouds that looked about over Center Peak. Got a bit low (as usual for this crossing) till I found some lift, but once I gained another 2000ft., I was able to connect with the clouds, and from then if was a one way road UP and north, topping at 10,500ft. near Hernandez Reservoir. 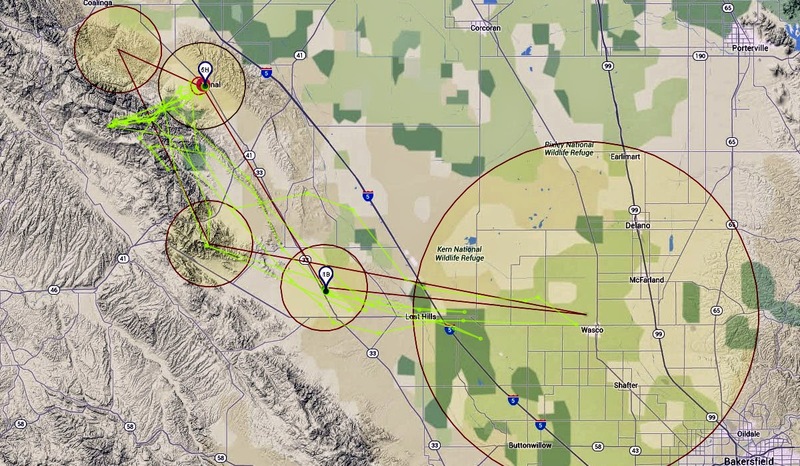 All along I heard BG and another glider from Hollister negotiating their way back to Hollister, and I even saw them once on Flarm, but never got a visual! Rest of the flight was a series of quick runs, and every time I was ready to call it a day, I hit another 8 knotter that was hard to resist. Thought of going farther south, but it was getting late, and I knew Richard was crewing for me, so I didn't want to push my luck (or my "crewing credit" for next time), and I elected to stay north of 46. Perhaps a mistake, given the fabulous lift I was yet to encounter, long after 6pm! One interesting climb worth noting was a 10 knot climb north of Coalinga after 6:30pm, while flying straight and level (see picture)! Almost every climb I tried brought me again up to 8000ft. even that late in the evening. At 7pm it was time to land, as I was not sure if there was anyone left around to help me disassemble my glider. One less thing to worry about, once I finish building my hanger, very soon. 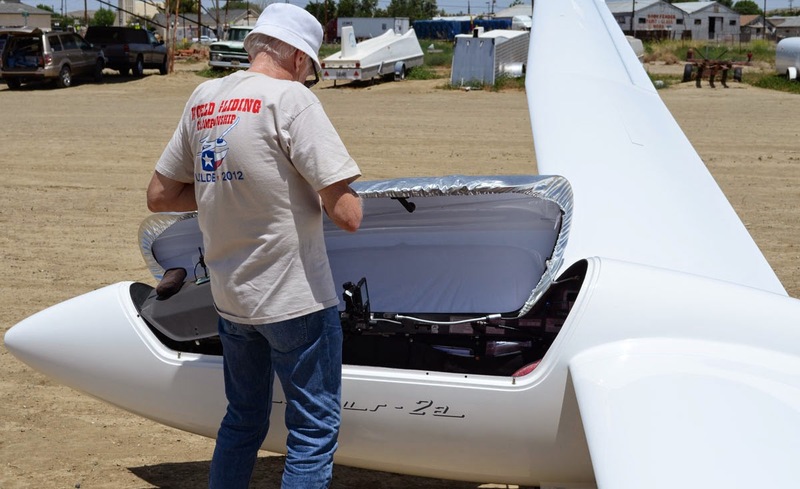 Fortunately, Pancho was still around after also finishing a 4 hour flight, so we both helped each other take apart our gliders, before heading home. Thank you Pancho for sticking around. All in all, a sweet local flight, still covering 280km, in this OLC track. A few "instrument panel pictures" are attached. A late start but a great flight. We had a full house of family visiting over the holiday weekend from Denver and Tuscon and a few of them wanted to go gliding. 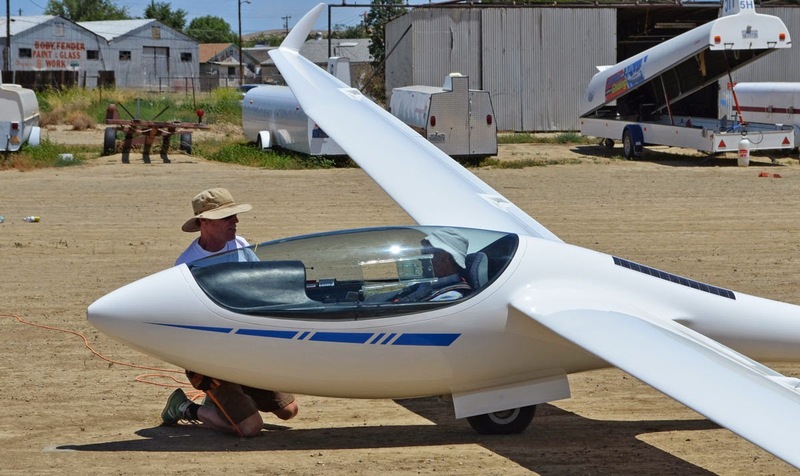 We ventured down to Avenal on Saturday so I could show them what gliding is all about with my newly earned rating and back-seat checkout. I took my wife's cousin's husband (cousin-in-law-in-law? 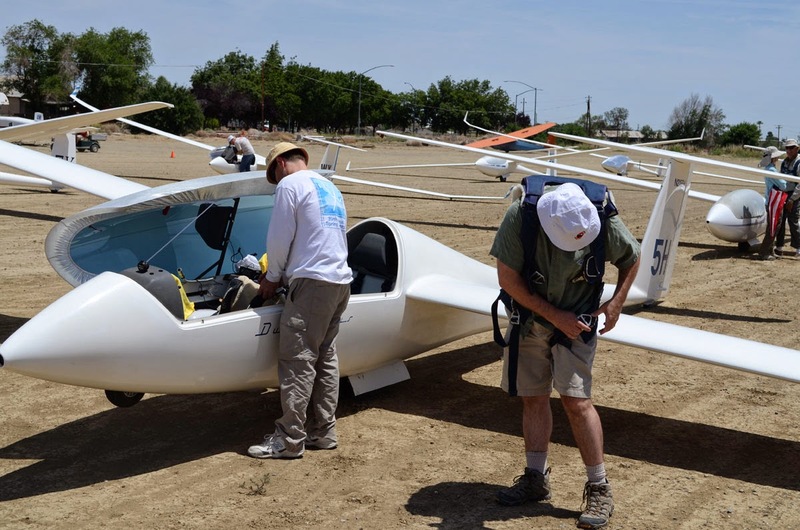 ), Travis, for his first glider flight and he absolutely loved it. He later hitched a ride with Andrew in the tow plane to see what the other end of the rope was like as well. Next up was my brother-in-law Andy, and he also thought it was really cool. Finally was Andy's friend Will, who really enjoyed himself too, but decided he'd had enough turning after thermalling for 5 minutes or so. We found lift during all 3 flights and had to choose to come back down, which made for great rides for people not familiar with soaring. I think we have some pictures that I'll send tomorrow if you want to include them. Carl's wife Elyse and friends Travis and Andy. The launch line got busy during the early afternoon. "Took Orange Crush up for a 3000' tow, Andrew did a really excellent job of exploring the area and finding some good lift. Got off around ~2500-ish over the prison, found an instant thermal over one of the northern guard towers. Borrowed the variometer, having an audio one hanging around your neck while in a 'low tech' 2-33 is a huge difference, never soaring without one again! That thermal petered off around 3500, wandered down a farm road pointed to the airfield and found a really nice one on the western edge of a square green field. Rode that one for around 40 minutes, in a fairly wide racetrack pattern, eventually topping out at 5400'. A few private gliders joined me for the lift then peaced out to the mountains. Big Bird and I were cross-circle for some time, just enjoying the lift and trying not to hit each other. While I fly up to 3 feet away in formation at my 'real' job, I'm still working on my formation skills in gliders so that one was considerably wider. Unfortunately calling a 'fights on' wasn't possible with no radios between the 2-33's ;). Finally all the lift smoothed out and it was time to come home, a solid .9 in the logbook for the win." Chris is looking forward to a nice long flight. A young bachelor needs to stay in touch with all his "friends". 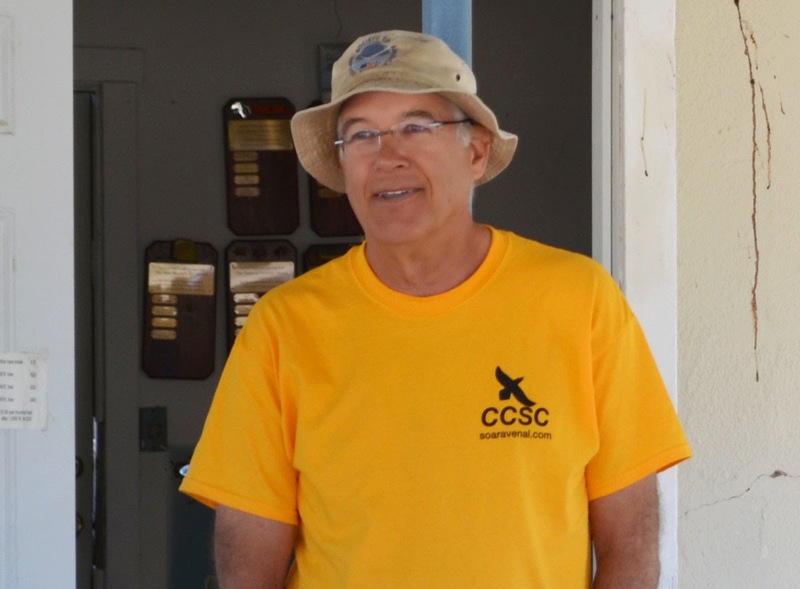 I had a nice 40-minute demonstration flight with Suzanne Spurrier, potential new member, from 1500-1540PDT. Able to gain 1400 ft in the course of the local flight providing a glimpse of the joy of soaring and she seemed to enjoy it very much. Hopes to be back. 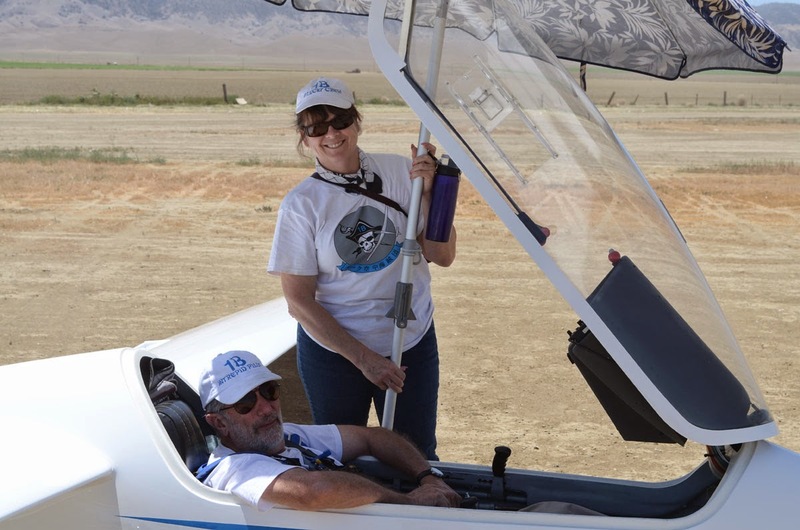 Dan helping Suzanne get belted in for her first glider flight. I took a tow to the mountains between Tar Canyon and Castle Peak. I worked some lift along the ridge line but lost altitude and headed back. On the way back I found 5-7 knots down before finding some lift to work. I went through several cycles like this before using a well marked 8 knot thermal (Thanks Pancho!) that included a very angry Red Tail hawk. I took this back to the mountains, found some lift then sink. The convergence was visible to the north and I was hoping to stay up long enough while it moved south but it was not to be. The flight was 2.2 hours. Hot but not too hot! Reported peak temps around 96 degrees. Light and variable winds. Sparse cumulus clouds west of the ridge began to appear around 1 PM and continued to cycle throughout the day. Very few dust devils were observed from the airfield but lift from the valley floor was certainly present. Kudos to John Harbick who arrived early to make the fuel run. He filled both the cart and the cans to keep the towplane fed for a few days of operation. He later made a couple training flights in the 2-33. There must be a check ride on the horizon…. Del arrived on the field around mid-day. Always great to see him at Avenal. He and Jan prepared his faithful 1-26 for sale with the requisite annual inspection. The new owner is lucky to get a Schweitzer with that kind of history (and such a cool paint scheme). Jan Zanutto and Andrew Ouellet. shared the towing duties for the day. 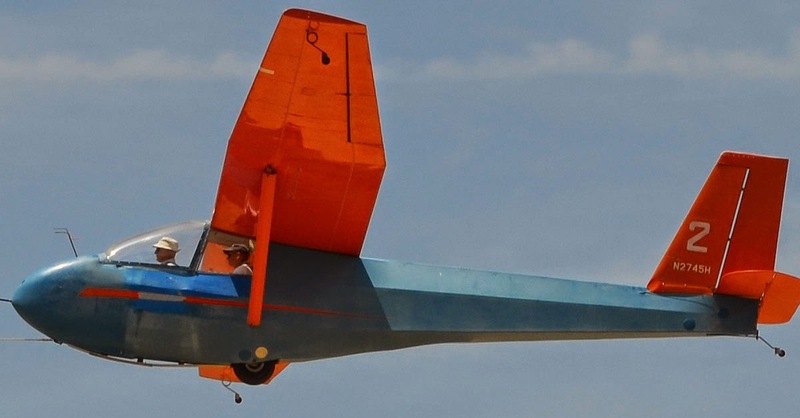 My guess is that with all the bumpy air down low, it was challenging to keep a glider in the rearview mirror! All the club ships were in frequent use during the day. Andrew made a few flights with Harold in preparation for his checkride. 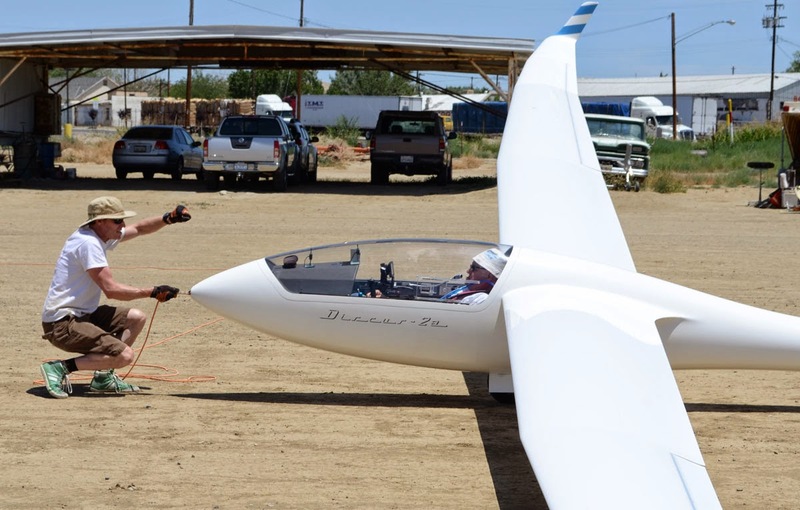 His terrific energy management and ability to put the glider where he wanted indicates that he is ready (for the flight portion of the test, for sure). Carl Engel had an entourage around 13F. I believe he gave some rides and showed his friends a different view of the valley. Dan Clark had a real rope break. Although the failure occurred at low altitude, he made all the right moves and landed 07 with a perfect rollout. Additionally, Larry Johnson, Craig Gifford and Chris Reilly all got stick time in the 2-33's. Richard Walker went hunting in the 1-26. He and others found strong lift at the crop squares West of the field and the crop circle to the NW. Max altitudes in this area seemed to top out between 5,200 and 5,500. Michael Paoli then explored for lift in a 1-26. Good to see him stretch his legs a bit. Yutaka Buto also did a few laps in the 1-26. In private ships, Joe, Pancho and Peter S. all had similar experiences of not quite having the necessary altitude to connect with the clouds that marked the meat of the convergence west of the mountains. 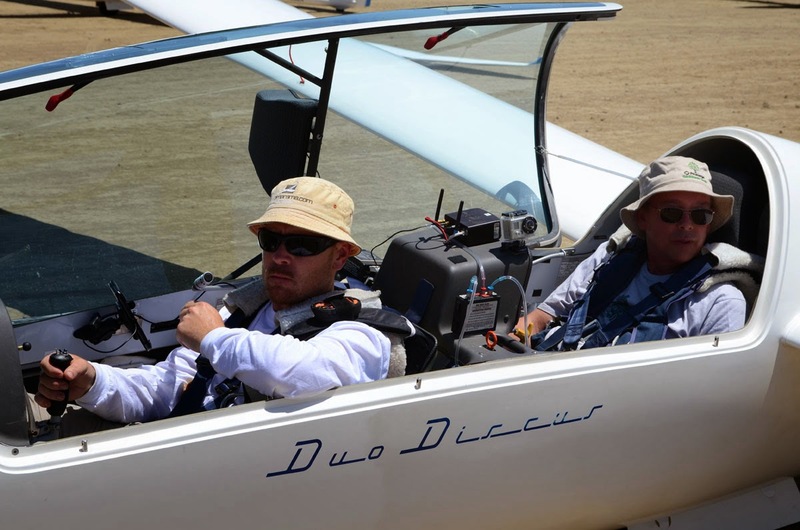 Pancho got close to 4 hours in the Libelle. Multiple attempts to connect with the cumulus were foiled. The Hollister guys were reporting 10,000 under those tempting clouds but it just wasn't to be for the Libelle. Joe and Peter S. made similar observations. Strong but tight lift in the valley topping out in the mid 5k's just wasn't enough to get across the ridge to the clouds. It was a late start for Ethan Ronal but a fantastic flight. He was the last to launch but took advantage of lift that continued to improve late in the day. 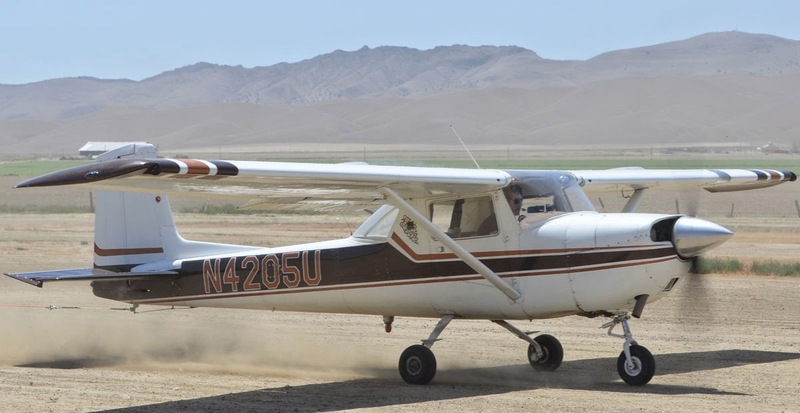 He was able to work the convergence both to the North and South and even made a last run across the Kettleman Hills into the Central Valley late in the flight. Richard and Pancho drew straws to see who would stay and assist Ethan putting his glider back in the box. Early evening conditions yielded at least 10,000 foot heights and a flight time of approximately 4 hrs. Yup, another great day at Avenal! Finally here is a summary of photos including Craig Gifford in Big Bird. Joe Anastasio waiting to launch with Larry Johnson standing by. Later in the afternoon, only a few gliders needed launching. Craig Gifford flew Big Bird to the best flight he's had so far. Dan Gudgel and Suzanne Spurrier still thermalling in the afternoon. Craig Gifford on base leg for runway 31 at Avenal. Short final for Craig after a very nice flight with excellent thermalling. recorded at 2:53 and 2:58 PM. Temperature: 77° - 83° F during contest. 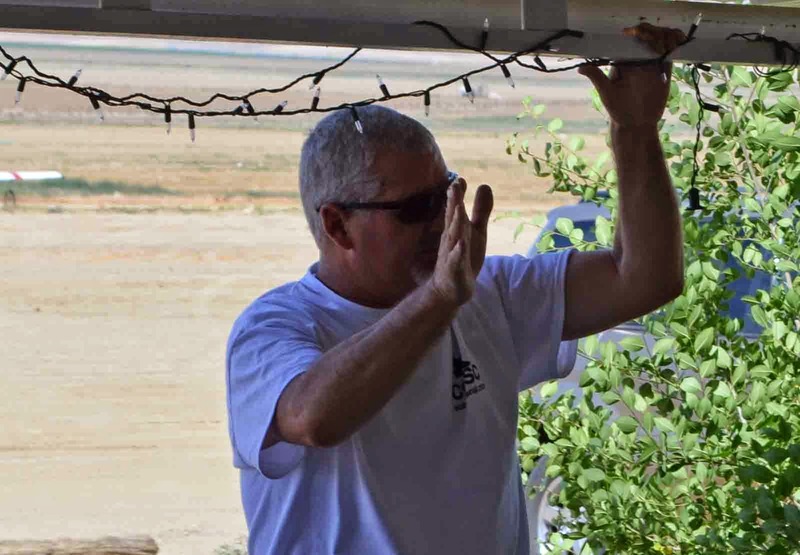 Sitting on the patio and looking out at the sky, Larry said, "Even a blind glider pilot could find lift today." A while later, the sky looked so good that if there was any way we could finagle a late entry, those of us on the patio would have launched the 2-33As, and we were sure we could not only complete the course, we figured with the handicap a 2-33 must have, we would likely be top scores! CUs marked the lift very well today. There were cloud streets from left to right, in an almost continuous band--continuous enough at the peak even a 2-33 could go from one to another. On the ground we were seeing lots of dust devils. Here are three distinct vortices at 2:34 PM in the field south of runway 7-25. 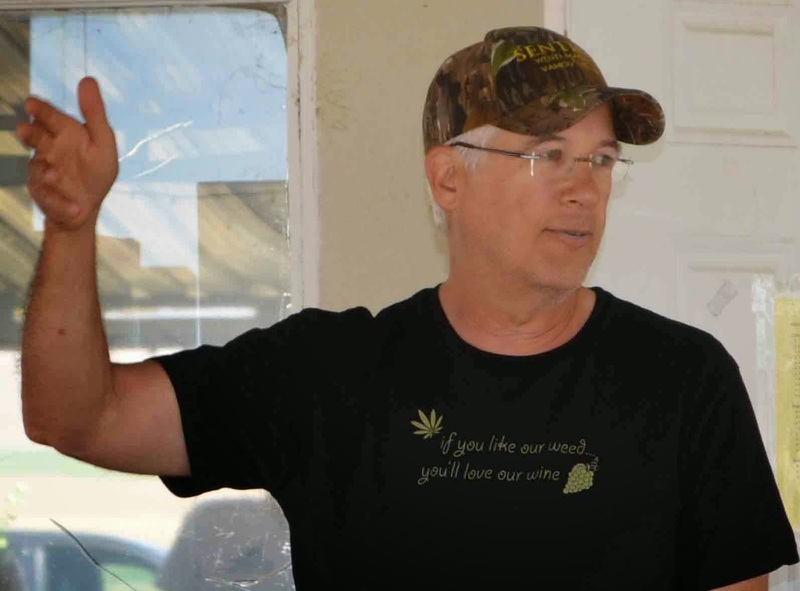 Earlier in the day, at the Briefing, Bill Gawthrop models his "winner's shirt" earned the day before. He has good reason to smile as he tells about his day yesterday. 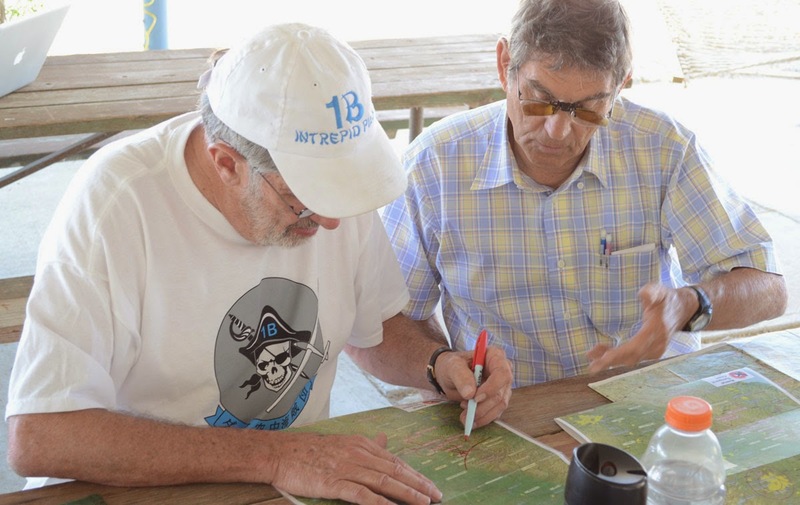 Walt Rogers, giving the weather briefing, points to where the markers should be forming later. 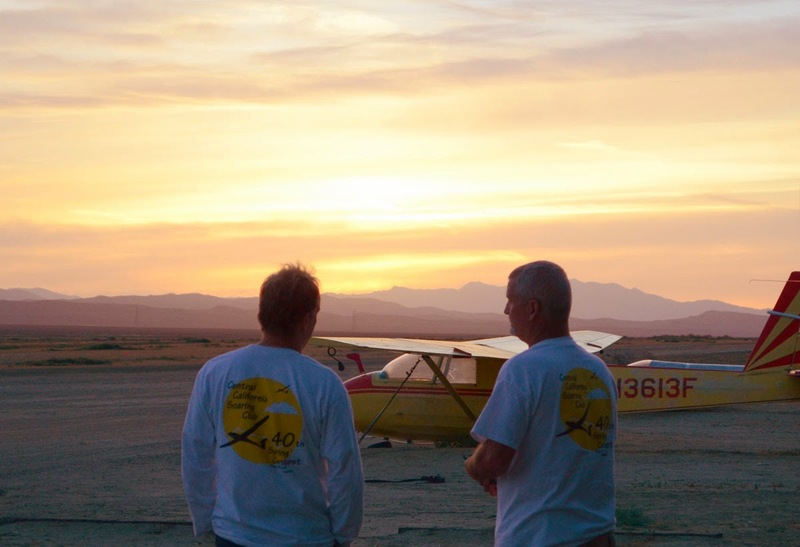 Jim Darke and Sergio Colacevich compare strategies on the day. Morgan gives him his input. Andrew Ouellet pilots the 150. Jan Zanutto does the Avenal IFR departure behind the 150. Morgan Hall is taking Jeff Richardson up today in 5H. Nina is providing Jim with shade while he waits for his tow. Pancho Herrera gives a test tug on the rope of Walt Rogers' Discus 2A, "WX." Pancho attaches the rope for Sergio. Pancho is running the wing for Thorsten Strepple, and Nina is now providing shade for Bill Gawthrop. It is now Bill's turn for launch. Markers are beginning to form right after the last sailplane is airborne. Everybody "made it home" today. Bill, if you had called us on the radio, we could have had your trailer open and the ramp down so you could have gotten even closer! Morgan on very short final. Sergio about to touch down. Here are the traces for the day. And the day's Preliminary Scoresheet. Today was a fantastic way to end the Contest! 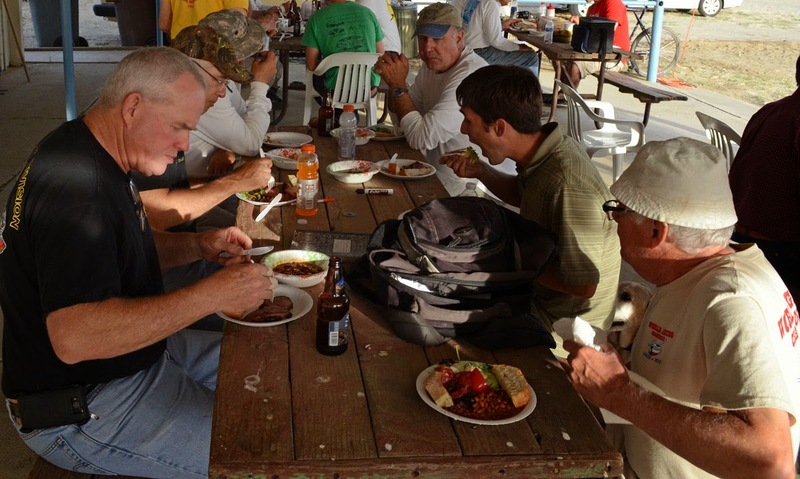 Most of the contestants remarked what a good soaring day it was. Even with yesterday's "Land-out Day," today's contestants (except for one who is planning a move) indicated they would be back next year. 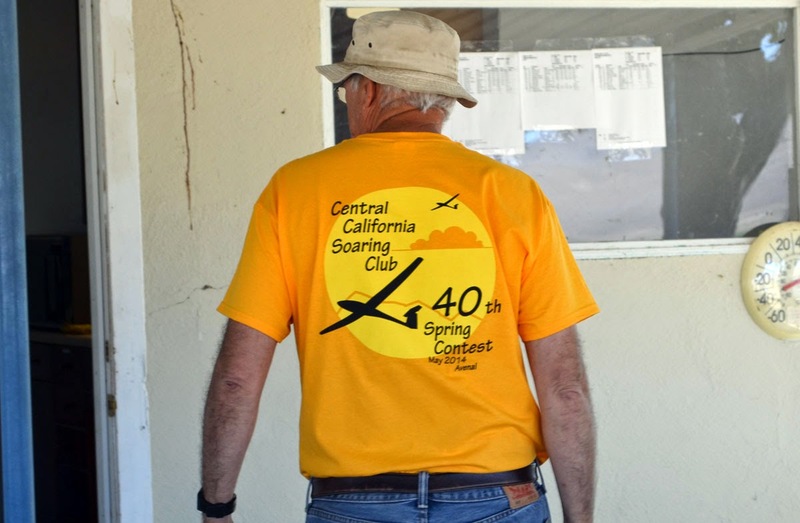 A great way to cap off 40 years of Central California Soaring Club's Spring Contest! Scott Ellis brought his Phantom Quadcopter out with him and got some great shots of the grid from a unique perspective that only the Ravens typically get. Definitely watch on Youtube in 720 HD for full effect. Wind: E - NNE, 1-9 MPH, gusts to 16 MPH around 4:35 PM. Temperature: 87° - 90° throughout the contest time. Tow pilot: Dan Gudgel in the Pawnee, Andrew Ouellet in the 150. 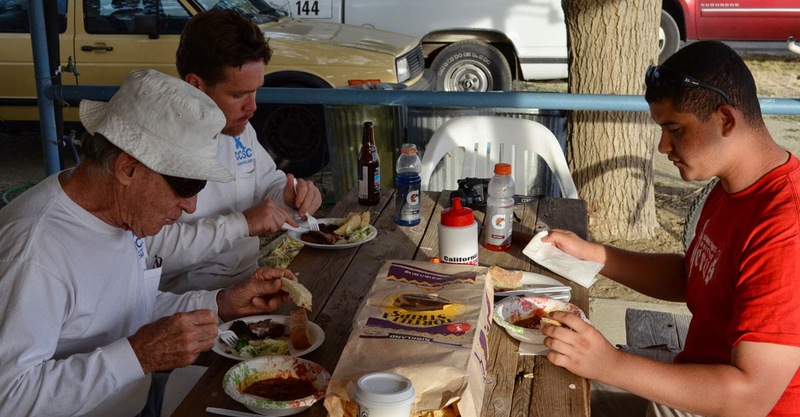 Fortunately, all of the land-outs were at Paramount Farms, which is an easy retrieve from Avenal. 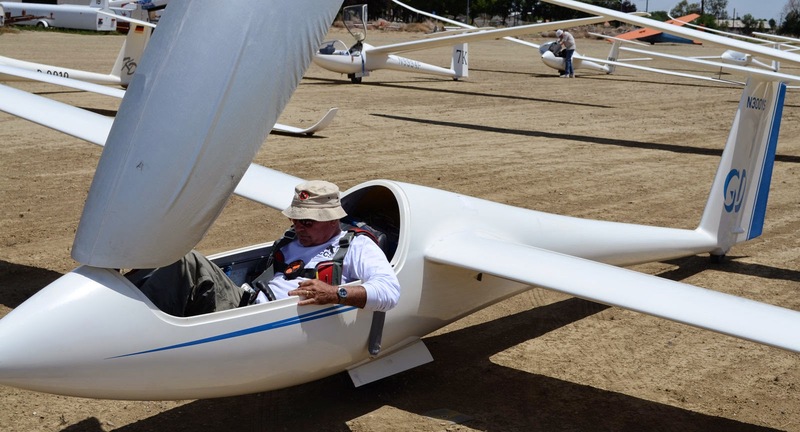 There were also enough people at the gliderport so that a trailer was soon on its way for all six gliders. Jan Zanutto is talking about his flight yesterday. Erik Bick is talking about the strategies he used yesterday. 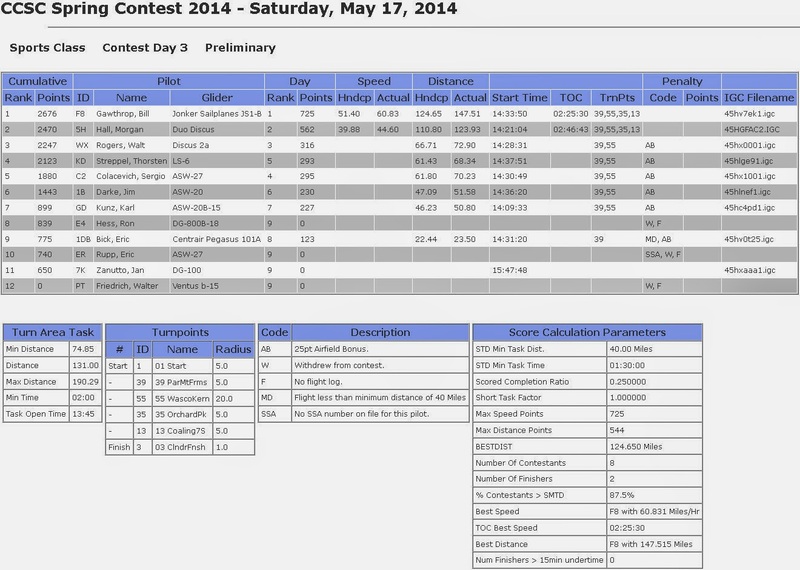 Bill Gawthrop discusses the strategies he used yesterday to win the day. 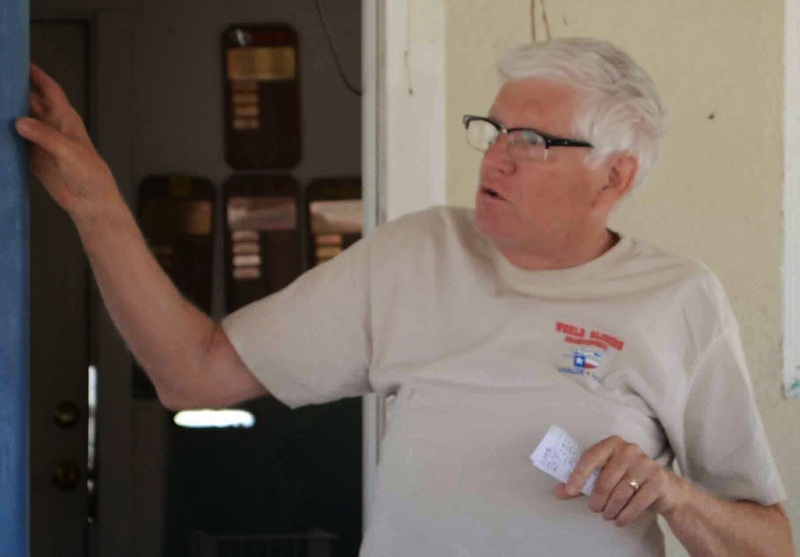 Walt Rogers gives the weather briefing to the group. 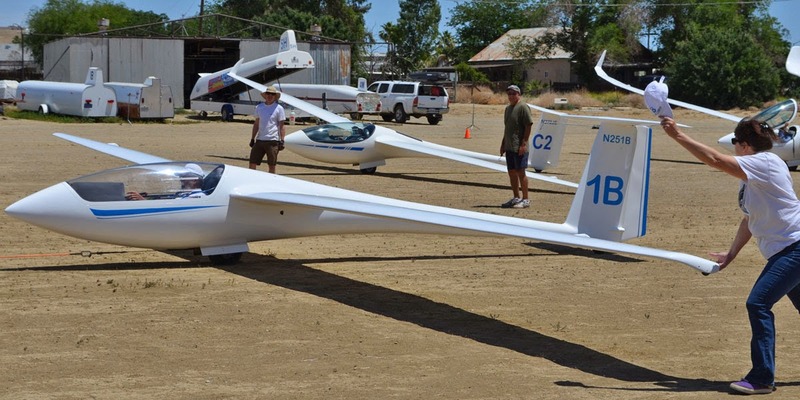 Nine sailplanes are on the grid today. Zero clouds are in the sky. Dan Gudgel is towing in the Pawnee today. Karl Kunz is in "GD," awaiting his turn. Morgan and Steven Kane are getting ready to go up in "5H." 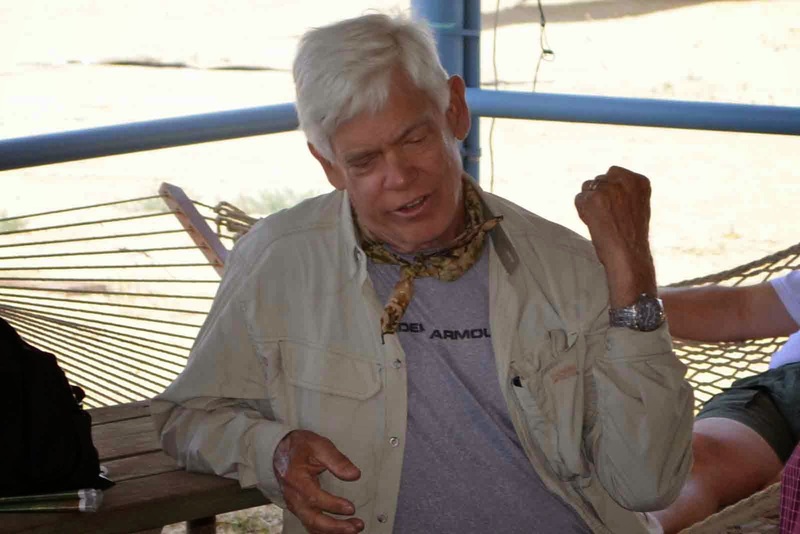 Karl Kunz performs the standard Avenal IFR departure; "I Follow Rope." A couple of minutes later, Thorsten Strepple performs the same departure. 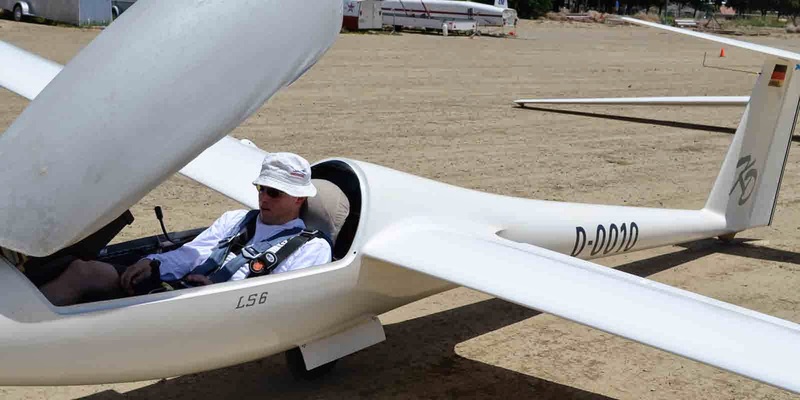 Arriving at four feet AGL, Eric Bick is "VFR On Top." Scott Ellis is running wing for Walt Rogers, Joe is waiting for the next rope, and Nina is providing shade for Jim Darke. 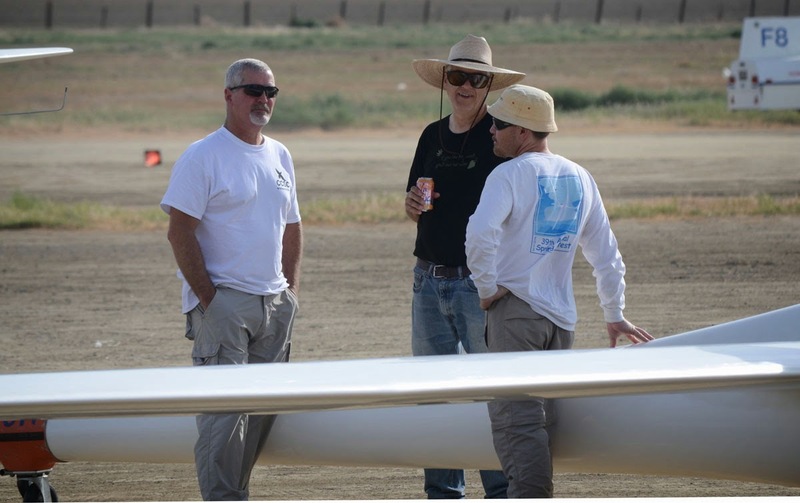 Scott is now running wing for Sergio Colacevich seated in the sailplane, Jeff, Joe and Martin watch, while Nina provides shade for Bill Gawthrop. 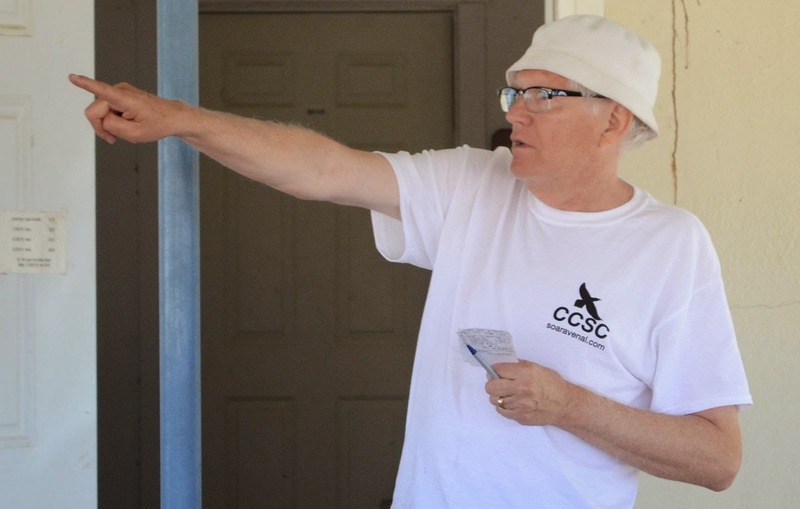 Both before the contest began, and while all of the contestants were away on the Task, Dan Gudgel was able to take a couple of students up on short flights in "Orange Crush." Here it looks like Edo McGowan is in the front seat. 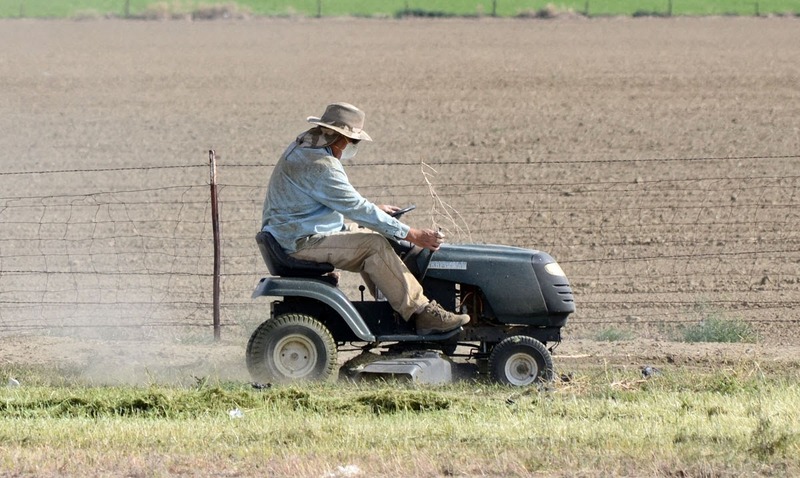 While everybody is up flying--or by this time retrieving--Martin has used his mechanic skills to repair the mower, and the weeds on the south side of runway 7-25 are succumbing. ...and have headed to, Paramount Gliderport, now open for business. 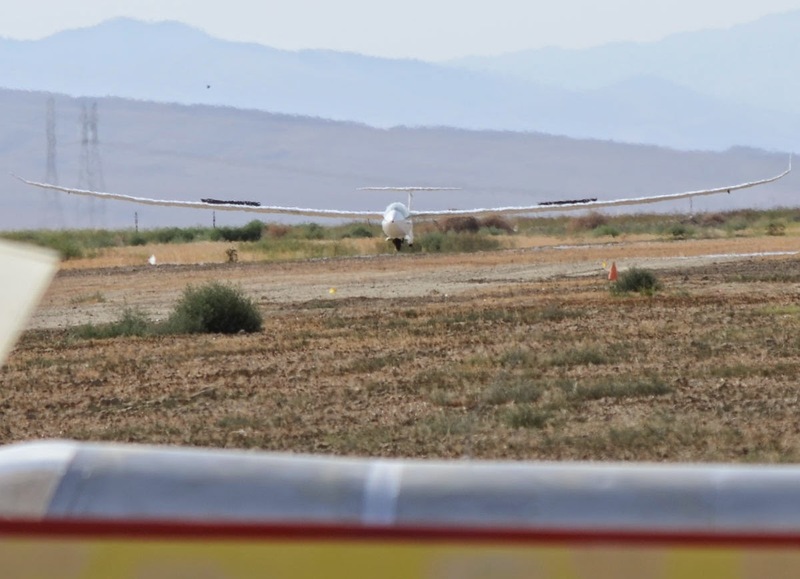 The second of three who landed at Avenal, and the first of two who completed the task, Bill's high-tech ship appears above the low-tech 2-33A "Big Bird" and the 1-26. Morgan and Steve show up a few minutes later in 5H. 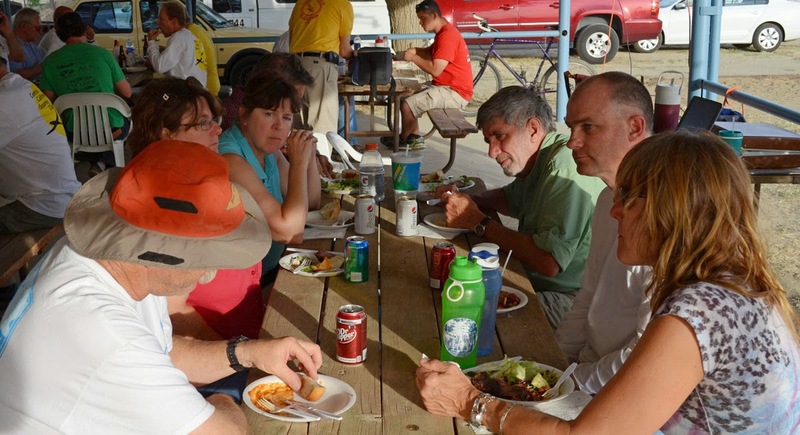 Jan, Bill, and Morgan--the only three who landed at Avenal--talk. Jan deserves the "Decision of the Day" award for abandoning the Task and returning to home port. 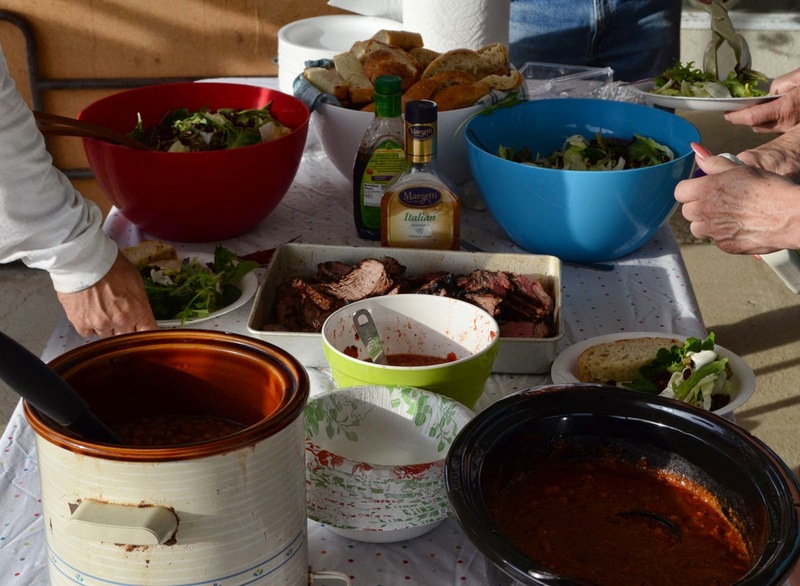 The banquet that Julie prepared was good and enjoyed by all. 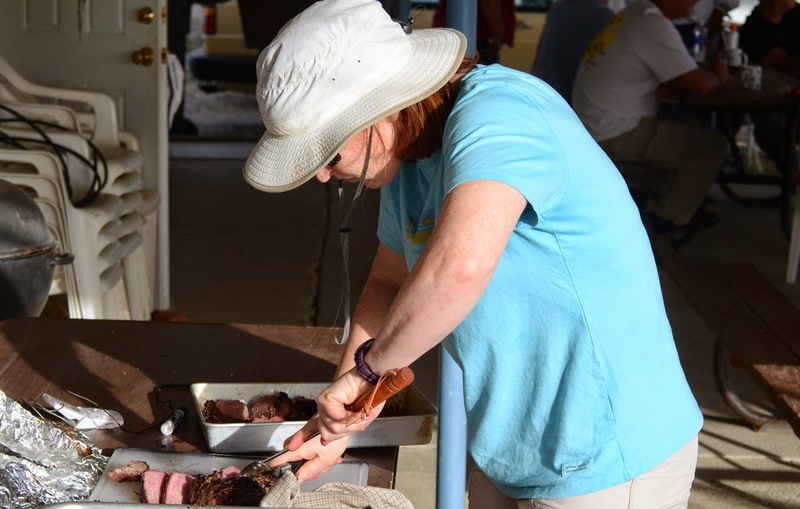 After the retrievals start arriving, Julie begins carving the tri-tip for the banquet. A lot of good conversation was had in the evening. Preliminary Scoresheet for the day.